I’d heard about this hippy market for quite a while. Travelling around the Algarve many people had asked me if I was going, it seemed like quite a big event. The market is always on the fourth Sunday of the month and has been happening for many years now. From what I can tell it’s an extension of a local flea market that happens at the same time. People from all around the area come to sell, socialise, play music or just chill out. 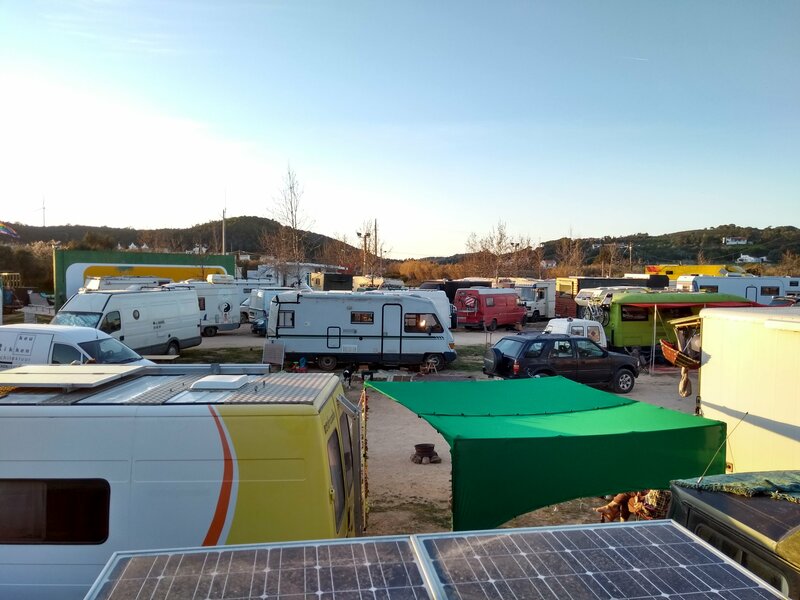 When I arrived there were already about twenty vans parked up in a circle around a large dirt car park. With the market being completely unorganised people just showed up and parked wherever there was space. As the days went on, more and more people arrived. By Saturday the whole area was full with vans, it seemed like there was no more space but people kept arriving! It was like a mini festival, there was music, fires, food and the whole place had a real buzz, I’d never experienced this kind of atmosphere outside of organised events. At night the French played techno and did tricks with fire! The first thing that struck me (apart from the number of dogs!) was the sheer amount of music being played. You couldn’t walk for ten metres without stumbling across a jam. The variety of instruments being played was unbelievable, at one jam I witnessed a flute, a clarinet, a didgeridoo, a guitar, a djembe and a conga drum with a girl freestyle singing over the top, it was mind blowing. I’d never heard anything like it, and it was good, it was wasn’t just a mishmash of sound the musicians were completely attuned to what the others were paying at the music morphed and flowed as different people took the lead. It was at this point I knew I needed to try and capture some of this music. I managed to get some great recordings and thought they definitely needed sharing so I put together a collection of my favourite into an album. Enjoy!